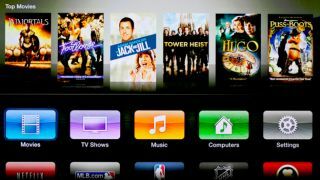 A former Apple software engineer has claimed that the new Apple TV UI is based on designs 'Steve Jobs tossed out five years ago' because he didn't like them. Michael Margolis, who helped to design the previous software for the hockey puck-like set-top box, says that the new era at Apple is devoid of Jobs' obsessive perfectionism. In a shocking series of tweets, Margolis said there's no-one left at Apple to say no to bad design. The former Senior Software Engineer tweeted: "I implemented the Apple TV 2.0 UI years ago. The new home page UI makes me want to cry." He followed it up with: "Fun fact - those new designs were tossed out about 5 years ago because SJ didn't like them. Now there is nobody to say "no" to bad design." Since Steve Jobs, the Apple co-founder and former CEO, passed away in October, it has been largely business as usual for the company under new boss Tim Cook. Record iPhone and iPad sales have been recorded en route to Apple becoming the world's most valuable publicly-traded company with share prices approaching $600. However, the explosive comments reflect the fears of many observers, who felt that Apple may miss Jobs' most distinctive personally trait; his refusal to settle for anything short of what he deemed to be perfection. Does the new Apple TV interface suggest the company is missing Steve's Midas touch or is it, like most of us thought, simply a means of making it look and feel more like iOS? Is this the beginning of Apple rejoining the rest of the pack or is it simply sour grapes from someone no-longer in the (Infinite) loop.